Frank Zumek and Brad Darby display a smokehouse full of ready-to-eat Easter hams. Easter is traditionally ham time. Grocers and local meat markets are preparing for the increase in sales, while shoppers are weighing the price differences and deciding which type of ham they’ll bake. Ham, a form of pork, comes with and without a bone. Customers make their choice based on convenience, cost and taste, local meat merchants say. Wadel owns the three-year-old meat company at 810 “C” Street S.E. in Auburn. He said the bone-in hams are a favorite among the older generation, because they take more time to bake and are more traditional. The boneless hams are precooked and processed. They are convenient, economical and slice easily. Wadel said he prefers a dry, bone-in ham because it has a nice texture. He said a baked, boneless ham packed in water may be juicier but it doesn’t have the flavor. He said the best hams are those that are dry cured and double smoked with not too much fat. A ham of that quality will cost between $2.39 and $2.89 a pound. According to Dave Box, meat cutter at Safeway in Enumclaw, hams with water sell better at the supermarket because they are half the price. Hams without water are leaner. He said since boneless hams are precooked they can be eaten cold and make good buffet or sandwich food. The 50-plus-year-old business located just off State Highway 169 has prepared 500 to 600 hams for this Easter season. Frank’s sells both boneless and bone-in hams. And much like the Auburn Meat Co., they sell more ham at Christmas. Last year Frank’s sold 1,200 hams at Christmas. “It’s because people party all through December. Easter is just one day,” Zumek said. The hams at Frank’s are sweet pickle cured and alder smoked for 80 to 100 hours in one of their three old-fashioned smokehouses out behind the market. Frank’s hams are seasoned with garlic, salt and pepper. There are no fillers or preservatives in their Midwestern pork. “It’s a mild cure ham. Not very salty,” Zumek said. She said they have customers from all over the state who come to purchase a ham at Frank’s. Frank’s bone-in hams run $2.29 to $2.39 for a whole or half ham that can weigh around 15 pounds. The price can run about a dollar higher for boneless. 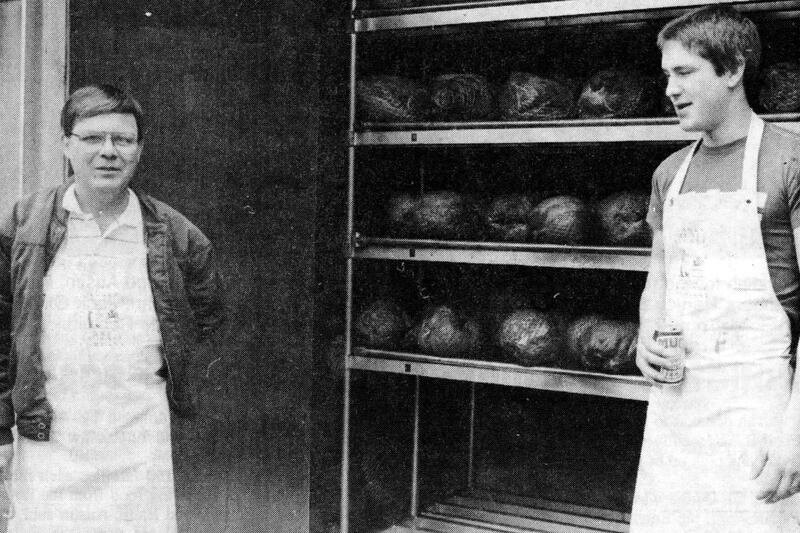 Frank Zumek started in the meat market business in 1936 at a shop down by the Black Diamond Bakery. He bought his own store in 1939 when he married Lois. The shop has been at various locations in Black Diamond and now sits just off of Third Avenue. Frank Sr. died just over three years ago. The market has been run by his son Frank for the last five years. The shop has been the topic of many area newspaper and magazine articles, television shows and in 1986 they were a recipient of The Seattle Times Gourmand Gutbuster Award for the Best Kielbasa sausage in the state. Lois Zumek attributes their great sausage to cook Marjorie Kari. “She’s our sausage maker and we’re one of the few places around that still uses the old-fashioned smokehouse,” she said. At Auburn Meat Co., Wadel said Kielbasa is very popular at Easter and he doesn’t know why, but if his Austrian grandfather says sell Kielbasa at Easter, then he does. The Zumek’s claim that Kolbase, like Kielbasa a type of sausage, is very popular at Easter. They have made up 5,000 pounds of the Polish sausage just for the holiday season. “The Europeans, the Polish in particular, after Lent eat Kolbase or Kielbasa. I don’t know the history. It’s a traditional thing,” Zumek said. So many wonderful memories of Franks Alder Smoked Hams. They were the best around, so smokey and aromatic! It was so sad when the family sold the company to someone else. They changed everything. The new owners did their own thing regrettably. I miss the smell of the ham, it would perfume up the car when left Franks. It was really special for my folks! Wish I had the recipe or method of making. I’d try it myself. Thanks for the memories.